These General Measurement Instructions Below are for Ruger Double Action Revolvers - GP100, SP101, RedHawk, Super Red Hawk and Alaskan, Security Six, Speed Six, and Police Service Six but generally apply to Most Firearms. Trigger assembly and Hammer assembly Measurements are generally done in the same way. In the Video Example below I show the basic way to measure the Hammer Clearance to fit and install Hammer Shims. Fitting and installing Trigger Shims would follow this same basic example. 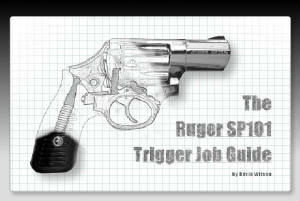 These General Measurement Instructions are for Ruger Double Action Revolvers, but generally apply to Most Firearms. between One Side of the Trigger and the Frame. In this example there will be about .009” trigger side play, yours may vary. Subtract .002” to .004" for Ending Clearance and divide the remainder by 2. Take two shim washers .003” thick and install them on both sides of the trigger. This will serve as a bearing surface and will keep the trigger from moving sideways when pulled. It will reduce friction and force the Trigger to make a more uniform contact with the Hammer. In the case of Trigger/Frame clearance of less than .006" a single .002" or .003" shim installed on the Left Side of the Trigger will give benefit to a Right Handed Shooter. After installing the shims, make sure the trigger moves freely with No Binding. Hammer Shimming; With the Hammer Main Spring Removed to Relieve Tension, Measure the Total Gap between One Side of the Hammer and the Frame. Unlike the Trigger, you will generally see a little more Clearance at the Hammer. This Clearance allows the Hammer to Rub the Frame, Causing Drag. Look at the Sides of the Hammer, if you see Arc-Like Scratches, it means the Hammer has been Dragging on the Frame. This Reduces Hammer Thrust and Speed, and in Extreme Instances could cause Light Strikes. Installing a Shim at the Hammer’s Pivot Point Reduces Side Play, and adds a Bearing to Reduce Friction and Prevents the Hammer from Rubbing on the Frame. Use the same formula for the Hammer as the Trigger. Use the Feeler Gauge to measure the Total Side Play between one side of the Trigger and the Frame. In this example there will be about .012" Hammer Side Play, yours may vary. Take two shim washers .005” thick and install them on both sides of the Hammer. The best way to do this is to install the Hammer then slide the Shim down the side of the Hammer. Use a Feeler Gauge Blade to push the shim into position. After the Hammer Pivot Pin is seated, Check the Hammer for Free Movement, and be sure there is No Binding. Shimming a Loose Hammer Dog can help with Double Action Trigger Pull. Shims are available in .002" through .009"
The gap between the back of the barrel and the front of the cylinder is known as the Barrel-Cylinder (B-C) gap. The Front-To-Back Movement of the Cylinder is the Endshake. To check B-C gap, hold the cylinder rearward and insert the (thickest that will fit) feeler between the Barrel and the Cylinder, this is your Barrel-Cylinder Gap, write it down, it should be between .004" and .008"
Next, hold the cylinder forward and re-check the gap, write it down. There may be no clearance here at all, the cylinder may touch. Our Cylinder Shims can be used to adjust your B-C Gap and Endshake. Available in the following thicknesses; .002", .003", .004", .005", .006", .007", 008" and .009"
Installing bolt shims requires fitting by hand, not measurement. Start with the thinnest shim, (.002") and install, then check to see how your bolt closes. As long as it continues to close normally, continue to add shims .001" at a time, stacking as necessary. remove .001" so it closes normally or just (ever-so) slightly tighter than normal. If you have to force or put undue stress on your bolt, you should reduce the number of shims.